Governor of Tamil Nadu Banwarilal Purohit addressing the gathering during the e-bhoomipujan of Suraj Eye Institute at Hotel Tuli Imperial while Sushil Chhabra, Vinod Nangia, Dr Girish Rao, Dr Vinay Nangia, Dr Francis Hiddema and Ashok Rathi also look on. “Eye donation is need of the hour and every individual should come forward for this noble cause. 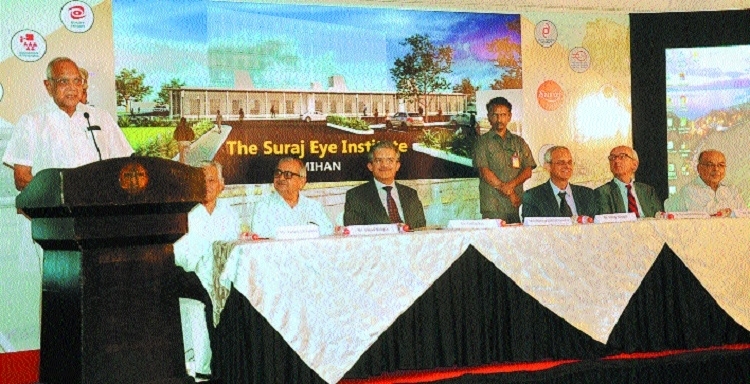 Society should encourage those doctors who are working to provide sight to a needy one,” said Banwarilal Purohit, Governor of Tamil Nadu during the e-bhoomipujan of The Suraj Eye Institute-Mihan here on Sunday. The foundation ceremony took place at Hotel Tuli Imperial in presence of august gathering. Purohit appreciated the work of Dr Vinay Nangia in the field of medical science. “Dr Nangia is giving a selfless service to the society which he is doing from last many decades. He is providing free service to thousands of poor people and now he is going to serve more people in this institution.” Purohit urged people of Nagpur to come forward to donate and help Dr Nangia to provide free services of eye treatment to people of Nagpur and Vidarbha. He also urged Dr Nangia to start mobile eye operation theatre to reach more and more remote areas of Vidarbha. Purohit also appreciated the persons who donated their eyes and were felicitated during the event at the hands of the chief guest. He said, “These donors are the role model for those who want to donate their eyes. Today they are honoured here because of their decision and service towards the society that is required.” The event commenced with Rashtra Gaan followed by lighting of traditional lamp. Dr Sarang Lambat, Consultant, Suraj Eye Institute talked about the eye diseases among premature babies. Dr Girish Rao, Medical Director, Sankara Nethralaya, Chennai and Dr Francis Hiddema, former CEO, The Rotterdam Eye Hospital, The Netherlands were the guests of honour of the programme. Sushil Chhabra, Vinod Nangia and Ashok Rathi also shared the dais. Dr Girish Rao inaugurated the Patel, Seth and Kela Retinoblastoma and Ocular Oncology Unit. Donors like Savitrabai Biyani, K K Kela, Navneet Bhai Seth, Rooshad Patel and Ashok Rathi were honoured for eye donation. Dr Hiddema inaugurated the Bhandara Unit of the Eye Institute during the event. Vivek Charde inaugurated the Suraj Eye Institute website. Dr Vinay Nangia proposed a vote of thanks.